Welcome to Aghadoe House B&B in Dublin, Ireland. Aghadoe House B&B a family run B&B and is conveniently located situated in Dublin City Ireland. Only 10 minutes from Dublin City Centre by bus or car and only 15 minutes from Dublin Airport. All our bedrooms have en-suite facilities (shower and toilet) and cable TV, delicious full Irish breakfast included or continental breakfast is included. There are plenty of traditional Dublin pubs and restaurants all within walking distance of our bed and breakfast. Our recently renovated Edwardian premises is open over 10 years and has been classified as a 3 Star Bed and Breakfast by the Irish Tourist Board Fáilte Ireland. You are assured quality accommodation, delicious breakfast and an excellent location in Dublin City Centre. We are approved by the Irish Tourist Board Fáilte Ireland and Family Homes of Ireland and are also members of Dublin Tourism. Also In 2004 our B&B won a merit award in the Fáilte Ireland Irish Welcome Awards. 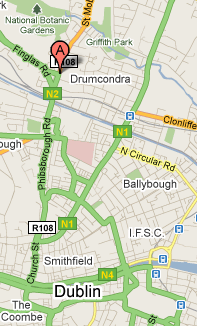 There are plenty of good traditional Dublin pubs and restaurants all within walking distance to our B&B. Go to our Map & Directions section to see our central location to the above attractions. Our B&B is also located near many Dublin hospitals such as Beaumont Hospital, Bons Secours Private Hospital and Cappagh National Orthopaedic Hospital.